In a previous study done by the group in 2016, one type of IEG gene known as EGR3, that normally responds to environmental events and stressful stimuli, was found repressed in the brain of BD patients, suggesting that when facing a stressor, the EGR3 in BD patients does not respond to the stimulus appropriately. Indeed, BD patients are highly prone to stress and have more difficulties dealing with stress or adapting to it if compared to healthy individuals. What the research group is now suggesting is that both EGR3 and BDNF may each play a critical role in the impaired cellular resilience seen in BD, and that each of these two genes may affect each other's expression in the cell. "We believe that the reduced level of BDNF that has been extensively observed in BD patients is caused by the fact that EGR3 is repressed in the brain of BD patients. 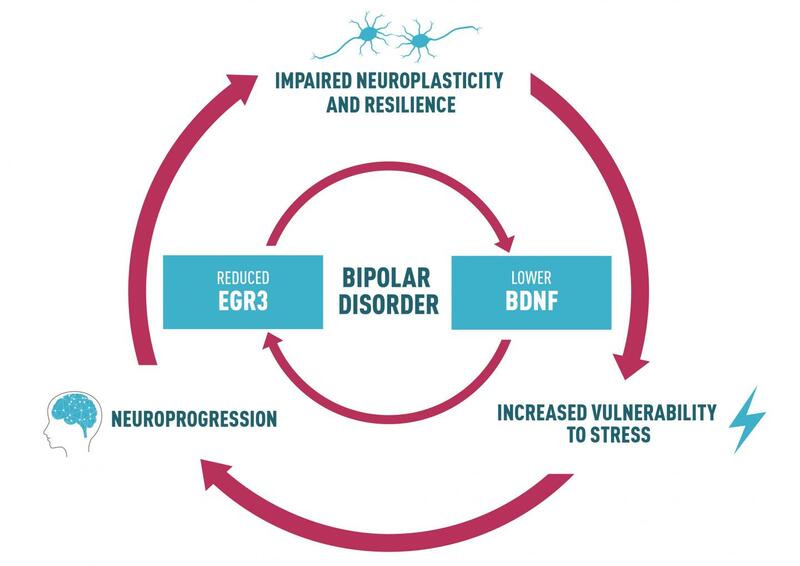 The two molecules are interconnected in a regulatory pathway that is disrupted in BD patients," says Fabio Klamt, leading author of the article entitled "EGR3 immediate early gene and the brain-derived neurotrophic factor in bipolar disorder" and published on February 5th in the journal Frontiers in Behavioral Neuroscience. The authors also add that the fact that EGR3 responds very quickly to environmental stimuli renders the molecule a potential drug target. "It is possible to imagine that EGR3 may be modulated in order to increase its expression and that of BDNF, which may have a positive impact on BD patients," says Bianca Pfaffenseller, a scientist working at Hospital de Clínicas de Porto Alegre, in Brazil, and the first author of the study. The idea that mental disorders should be seen as any other chronic disease in which the underlying biology plays an important role has replaced the old descriptions of mental illnesses as the result of bad psychological influences. As Nobel prize laureate Eric Kandel has said, "all mental processes are brain processes and therefore all disorders of mental functioning are biological diseases." The perspective article authored by Fabio Klamt and colleagues supports this view by offering new insights into the underlying biology of this lifelong and devastating mental disorder affecting millions of people worldwide. The study was supported by the Brazilian grant CNPq/MS/SCTIE/DECIT – Pesquisas Sobre Doenças Neurodegenerativas (466989/2014-8) and INCT-TM/CNPq/FAPESP (#465458/2014-9).